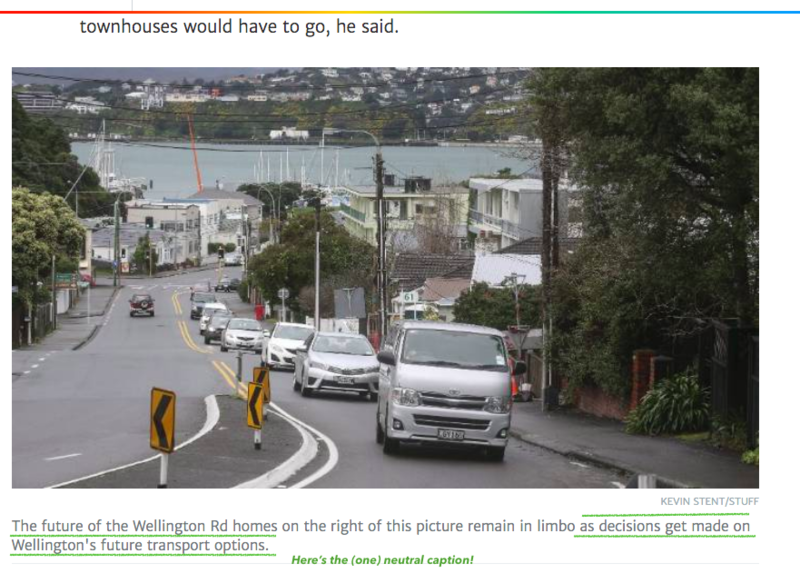 If you’re a normal human, there’s a trend in mainstream media about Let’s Get Wellington Moving (LGWM) that would leave you believing that Wellington getting a widened highway through Mt Victoria out to Hataitai is about as likely as Wellington having a sunny day in February. Not a certainty, but far likelier than not. Here’s the latest example, in the Dominion Post last week. 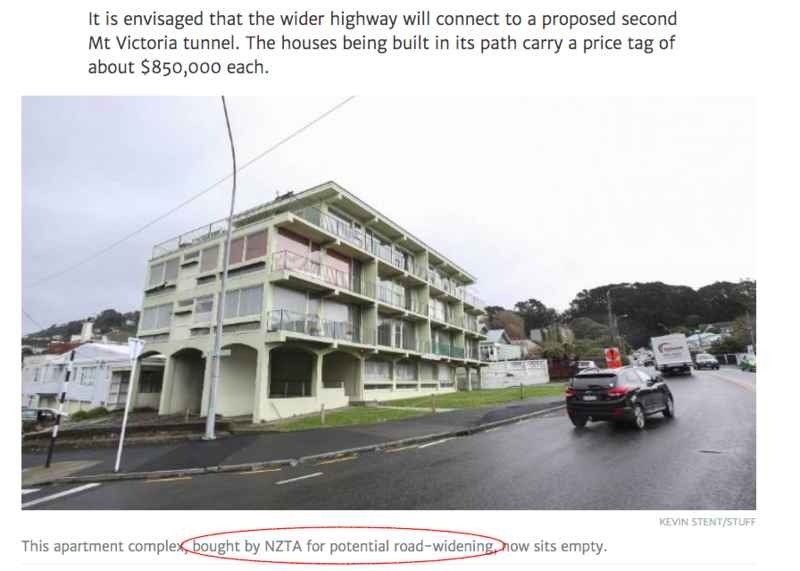 From the headline on, the only fate mentioned for this spot in Mount Victoria is “highway”… “road” …”widened road”. Some, if not all, of the under-construction townhouses – dubbed Pōneke Villas – will have to be moved or demolished if the road-widening goes ahead. NZTA has confirmed it may acquire them under the Public Works Act and demolish them. It is envisaged that the wider highway will connect to a proposed second Mt Victoria tunnel. It was impossible to say whether all three townhouses could be torn down as it was not yet known what roading project was planned. But under NZTA’s original plan to have six lanes along the stretch, all three townhouses would have to go, he said. No final decisions had been made on road-widening, [the council spokesman] said. And all but one of the captions under the pictures do the same. 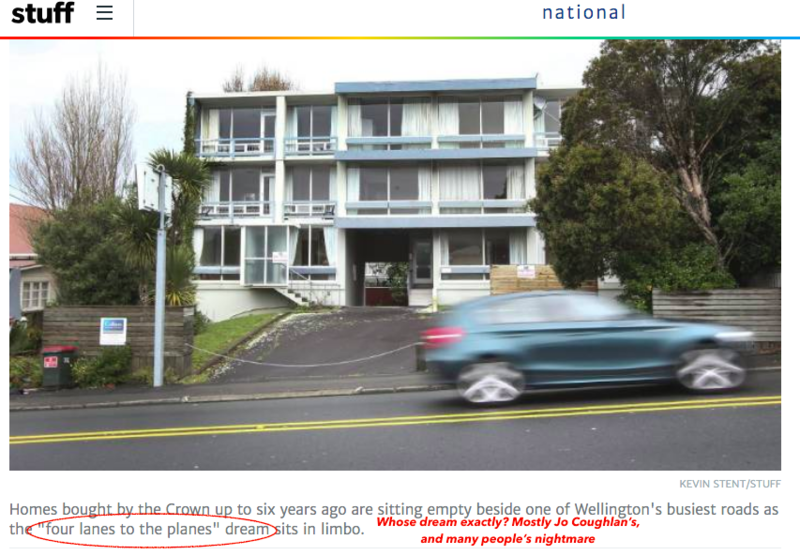 Now it’s technically correct that the original designation over this land – now lapsed with the demise of the Basin Flyover plans – was “for a motorway widening”, so one of those captions is less-bad. But in context it’s part of the problem. But here’s the thing. Any transport infrastructure – including a light rail or other mass transit line running through to the airport – would also involve a designation* over the land. It would involve Public Works Act acquisition and demolition of the housing development in the article (and potentially a few others). And the Transport Agency would apply for this designation* just the same as they did for their initial four-lanes-to-the-planes idea. So exactly the same story could be written – with the same drama – without implying that a bigger road is a certainty. This is a problem because this kind of talk creates a self-fulfilling prophecy in public expectation. 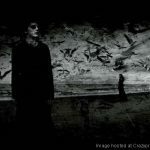 The more we hear that change is going to be “for a bigger road”, the more it subconsciously creates an expectation that this is so. 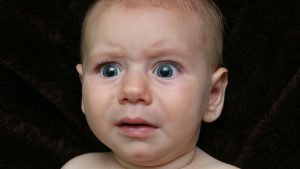 Think about it: if you’re talking with your dad about your birthday party and 80% of the time he’s talking about “your beach party” and “here’s what we’ll need to do to get everyone to the beach for your party…” and so on, it won’t take long before you’ll be pretty clear that it’s a beach party on the cards. But if he then announces your party will be a picnic in the park, you’ll be brought up short with cognitive dissonance. You had a story in your head about what was going to happen, and suddenly – it’s not! Something different! Fair enough, Dad’s not actually said it’s guaranteed you’ll have your party at the beach. When pressed, he can point to a handful of times he said “it’s not certain what we’ll do for your party”. Don’t underestimate this effect. Cognitive dissonances – in this case, when something from the real world runs against a narrative or concept you’ve built up in your head – are really powerful. Cognitive dissonance has been shown resoundingly to be able to override one’s real feelings and opinions about a topic (great stuff here). For example: with your party, if you’d not been primed to expect a beach party and the options were laid out neutrally, you may well say quite honestly that you prefer a picnic party (after all there’s way more fun stuff to do at the park for all your friends). But the cognitive gear-grind of thwarted expectation isn’t pleasant, and it makes you react initially with “But.. but.. Da-ad!” even though you actually don’t prefer a beach party. And this matters because the bulk of the meaningful, nitty-gritty LGWM decisions will come after the Cabinet decision, and be made by local politicians. They could, for example, try to force a motorway-widening project into the package with the bloody-minded vigour of Trump for his wall, even with the massive opportunity cost and generally terrible outcomes that would create for the city. If you’re one of the transport activists with wild hair and a tendency to conspiracy theories, you’d say it’s part of a mainstream media plot as part of the capitalist-industrial-corporatist-complex to build more roads. 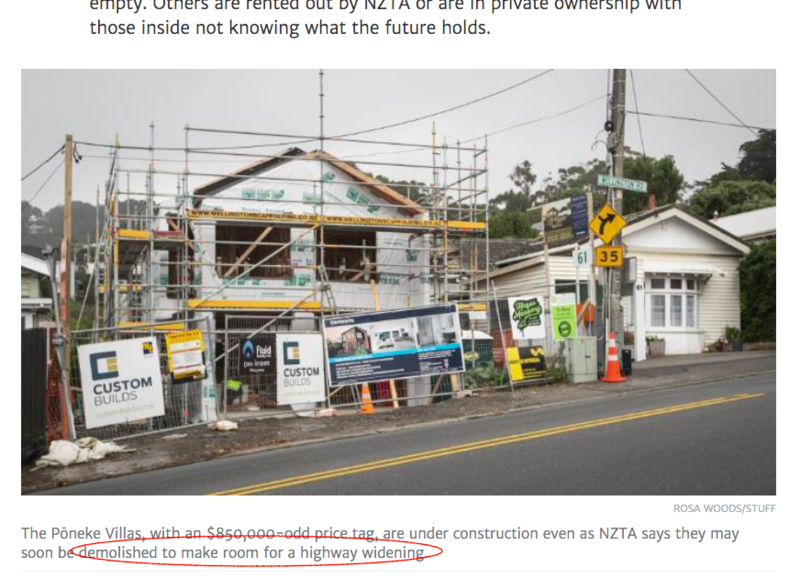 And the idea of homes being demolished for a new or bigger road is far more “accessible” to most than the idea of homes being demolished for a light rail line; in fact there’s coverage of that the same week with the Ōtaki-Levin section of the northern expressway. So creating an expectation of a bigger road is understandable, but ultimately damaging because of how we tend to react when we’re given cognitive dissonance. Well what’s a reader to do? So all I’m saying is: just be wise to this. Don’t drink this accidental coolade and end up believing a bigger road here is a certainty just because the discourse is all “motorway wider road road widening motorway highway”. And even if you do feel it a bit, don’t act all like “But Dad! ?” if/when LGWM announces there won’t be a bigger road through there… and instead, it’s for a new light rail spine that that daft guy’s development will get bowled. In fact, it’ll actually be the best party of all for Wellington if – for a while – we build other stuff than bigger roads to get us moving. So let’s hope our “parents” have our best interests at heart. What did you think when you read that Stuff / DomPost article? Do you feel a motorway widening is definitely on the cards? If so, do you think it’s for the right reasons? * A designation is basically a legal tool to define land that will be required for the construction, maintenance or operation of a project like Auckland’s City Rail Link, or a motorway. A designation effectively overrides all existing controls of what can occur on a site so enables the construction of public works activities as well as placing a legal restriction on what can occur within that site (i.e. you need the permission of the agency placing the designation if you want to do anything on the land). It also potentially enables the compulsory acquisition of designated land [forced sale to the government] through the Public Works Act.